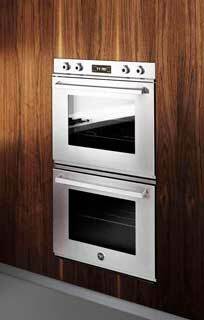 Our company Top Home Appliance Repair does Bertazzoni oven repair. We specialize in Bertazzoni repairs and maintenance on all models. Our services are fast, affordable and precise. Our technicians are factory trained and certified. They know everything when it comes to Bertazzoni oven repair and can handle the project of any magnitude. Give us a call, and we will quickly diagnose the problem and quickly find the solution. After a service appointment with us, your Bertazzoni will be working great! Bertazoni makes high quality, well-designed kitchen equipment. All of the Bertazoni ovens are state of the art. For example 30 Convection Steam Oven combines convection baking, grilling, and steam and delivers the healthiest and most flavorful cooking results. Such an oven can serve you well for many years. But if it brakes, you need a company with a lot of experience and knowledge of Bertazzoni appliances. We are such a company. We have more than 30 years experience in the field of appliance repair, and we are ready to take on any Bertazzoni repair project. Our team certainly has the skills and knowledge necessary to do a great job in Bertazzoni oven repair! But that is not all. We also have some of the best customer services around. We offer you flexible scheduling and same day appointments. Our company works around your schedule. With every repair, you get a accurate estimate and FREE service call. And the parts we will order for you will not only be genuine but also will have a 3 yearwarranty. What is more important our team will do their utmost to keep you happy. The results should exceed all of your expectations! Call us about your Bertazzoni oven repair and will schedule a convenient appointment for you. Our technician soon will be on his way to your house. He will bring all the necessary tools and equipment with him. We will try to preorder the parts for your oven. This way we can start repairing it right away. Our technician will assess the situation and troubleshoot the problem until he finds the right solution. Usually, appliance repair involves cleaning internal parts or replacing worn parts with new once. Our techs are masters at that job. They work fast and are precise and detail oriented. When you have such a valuable appliances, it’s very important to keep them well maintained, to change filters and do all the upkeep. They best way to do it is to hire a professional to do it for you on an annual or bi-annual basis. Our company offers such maintenance program. This program covers all appliances in your kitchen and laundry. As a part of this program, our technicians will do all the maintenance for you on a regular basis. They will inspect your appliances every time and catch any problems before they become significant. This maintenance service will save you time and money in a long run. Why choose us to do Bertazzoni oven repair for you? We are simply the best at what we do. Appliance repair is our bread and butter, and Bertazzoni oven repair is our specialty. Our company has more than 30 years experience serving our customers all around California. Those years of experience hones our skills and supported by hours of education every one of our technicians goes through. Each one of our technicians is factory trained and certified. They know everything there is to know about Bertazzoni appliances. Our team is ready to impress you with our work and customer service. Give us a call, and your broken appliances will be as good as new! For Bertazzoni oven repair, please call us at 925-265-7782 in East Bay or 628-214-0064 in Marin County. Or you can fill out our short contact form. We would love to talk to you and answer all of your questions. Besides Bertazzoni appliance repair are also certified to repair Asko, Bosch, Dacor, DCS, Electrolux, Fisher&Paykel, Frigidaire, GE, Jenn-Air, KitchenAid, La Cornue, LG, Liebherr, Marvel, Miele, Perlick, Samsung, Siemens, Sub-Zero, Thermador, Traulsen, True, Viking, Whirlpool, Wolf. We do both commercial appliance repair and residential appliances repair. Our company Top Home Appliance Repair does Bertazzoni oven repair. We specialize in Bertazzoni repairs and maintenance on all models. Our services are fast, affordable and precise. Our technicians are factory trained and certified.